THESE OFFICIAL RULES AFFECT YOUR LEGAL RIGHTS BY WAIVING CLASS ACTION CLAIMS AND WAIVING THE RIGHT TO TRIAL BY JURY. The Reynolds 360: You + Three Sweepstakes (“Sweepstakes”) is sponsored by Oconee Golf Company LLC, 1000 Vista Drive, Suite 119, Greensboro, GA 30642 (“Sponsor”). Sweepstakes is governed by these official rules (“Official Rules”). By participating, entrant agrees to abide by these Official Rules and understands that the results of the Sweepstakes, as determined by Sponsor, are final in all respects. Sweepstakes is subject to all federal, state and local laws and regulations and is void where prohibited by law. ELIGIBILITY. Sweepstakes is open to legal residents of fifty (50) U.S. States and District of Columbia, twenty-one (21) years of age and older and who have Internet access and valid e-mail at time of entry. 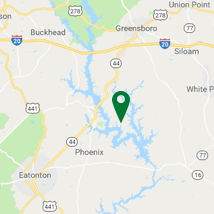 Any person who is the record owner of property at Reynolds Lake Oconee as of January 23, 2019 is not eligible to enter or win a prize in this Sweepstakes. Any person who has won a prize in a Sweepstakes offered by Sponsor in the last twelve (12) months is ineligible to win a prize in this Sweepstakes. Employees, officers and directors (current and retirees) of Sponsor and its affiliates, subsidiaries, franchisees, agents, associates, dealers, representatives, suppliers, advertising and promotional agencies (“Sweepstakes Parties”), as well as members of their immediate families (defined as parents, spouses, children, siblings and grandparents) and individuals living in the same household as those individuals are not eligible to enter or win. Sponsor reserves the right to verify the eligibility of each entrant. SWEEPSTAKES PERIOD. Sweepstakes begins at 12:00 am Eastern Time (“ET”) on January 23, 2019 and ends at 11:59 pm ET on April 22, 2019 (“Sweepstakes Period”). Entries must be received on or before the end of the Sweepstakes Period to be eligible. Eligible persons who signed up for Reynolds Insiders prior to January 23, 2019 will be automatically entered into the Sweepstakes. Enter Online: Eligible individuals who sign up for Reynolds Insiders on the Reynolds Lake Oconee website (located at https://www.reynoldslakeoconee.com/reynolds-insider) during the Sweepstakes Period will automatically receive one (1) entry into the Sweepstakes. Entrants may unsubscribe from Reynolds Insiders at any time. Sponsor is not responsible for lost, late, misdirected, or incomplete entries. No mailed, telephoned, faxed, or mechanically reproduced entries will be accepted. Receipt of entries will not be acknowledged nor will proof of submission of an entry be deemed proof of receipt. Sponsor has no obligation to advise an entrant of an incomplete or otherwise non-compliant entry. Use of automated entry systems and tampering with the entry process or the operation of the Sweepstakes is prohibited and any entries deemed by Sponsor, in its sole discretion, to have been submitted in this manner will be void. Entries generated by a script, macro, or other automated means will be disqualified. WINNER SELECTION. Total of one (1) Grand Prize. One (1) potential Grand Prize winner will be randomly selected on or about April 23, 2019 from all eligible entries received by 11:59 pm ET on April 22, 2019. The potential prize winner will be notified by email and/or telephone according to the contact information provided by that entrant up to three (3) times within a five (5) day period after the prize drawing. Please ensure email settings are set up to allow for receipt of email from Sponsor. Sponsor assumes no responsibility for undeliverable prize notification resulting from any form of active or passive filtering by entrant’s email settings or for insufficient space in an entrant’s user account to receive email notification. The potential prize winner must sign and return any required forms, including, without limitation, affidavit of eligibility, prize acceptance and liability and publicity release form and IRS-W9 forms (“Sweepstakes Forms”) to Sponsor within three (3) days after delivery of the forms. Return of the above-mentioned Sweepstakes Forms within the allotted time is the sole responsibility of the prize winner; Sponsor is not responsible for delays in delivery. If prize notification is returned as undeliverable or if a potential prize winner fails to comply with these Official Rules, cannot be reached by Sponsor, or fails to return the Sweepstakes Forms within the time specified, that potential prize winner may be disqualified, in Sponsor’s sole discretion, and a new potential winner selected from among all remaining eligible entries, time permitting. Prize information will be forwarded to each winner within four (4) to six (6) weeks after Sponsor has received the signed Sweepstakes Forms. If the potential winner is unable or unwilling to travel on dates specified by Sponsor, the prize will be forfeited and may be awarded to another alternate winner, time permitting. Prize winner is responsible for transportation for winner and guests to and from winner’s residence to airport. Prize must be taken on dates specified (or prize will be deemed forfeited by prize winner). All expenses and travel costs not expressly stated in the package description above, including, but not limited to, incidentals, passenger tariffs or duties, surcharges, taxes (if not included above) or other expenses are the sole responsibility of the winner and travel guest. Sponsor reserves the right to provide ground transportation in lieu of air transportation if the winner resides within two hundred (200) miles from Reynolds Lake Oconee. Any difference between the ARV and actual value will not be awarded. Winner and travel guests must travel on same itinerary on dates specified by Sponsor; no alternative dates are available. No changes will be made to travel details once any elements of the travel arrangements have been booked, except at Sponsor’s sole discretion. Unless a child of the prize winner, travel guests must be twenty-one (21) years of age or older as of the date of departure. Travel guests must execute liability/publicity release. Travel arrangements and other aspects of the prize are subject to change outside the control of Sponsor. Sponsor is not responsible or liable for any such changes and the resulting elements of the prize that may not be available. Travel restrictions, conditions and limitations may apply. Winner understands that there are inherent risks involved in travel and these risks may be present before, during and after the trip. Sponsor makes no warranties, representations or guarantees relative to the prize, and disclaims all liability for the provision, use, quality or nature of any third party product or service provided to the winner. Prize winner is responsible for all taxes resulting from acceptance and use of the prize, and all costs and expenses not specified as part of the prize. ADDITIONAL Limitations. Prize is non-transferable. No substitution or cash equivalent of prize is permitted; however, Sponsor reserves the right to substitute any prize with another of equal or greater value. Sponsor and its respective parent, affiliate and subsidiary companies, agents, and representatives are not responsible for any typographical or other errors in the offer or administration of the Sweepstakes, including, but not limited to, errors in any printing or posting of these Official Rules, the selection and announcement of any winner, or the distribution of any prize. Any attempt to damage the content or operation of this Sweepstakes is unlawful and subject to possible legal action by Sponsor. Sponsor reserves the right to terminate, suspend or amend the Sweepstakes, without notice, and for any reason, including, without limitation, if Sponsor determines that the Sweepstakes cannot be conducted as planned or should a virus, bug, tampering or unauthorized intervention, technical failure or other cause beyond Sponsor’s control corrupt the administration, security, fairness, integrity or proper play of the Sweepstakes. In the event any tampering or unauthorized intervention may have occurred, Sponsor reserves the right to terminate the Sweepstakes and void suspect entries at issue. Sponsor and its respective parent, affiliate and subsidiary companies, agents, and representatives, and any telephone network or service providers, are not responsible for incorrect or inaccurate transcription of entry information, or for any human error, technical malfunction, lost or delayed data transmission, omission, interruption, deletion, line failure or malfunction of any telephone network, computer equipment or software, the inability to access any website or online service or any other error, human or otherwise. limitation of liability. BY ENTERING, EACH ENTRANT AGREES TO RELEASE AND HOLD HARMLESS THE SWEEPSTAKES PARTIES FROM ANY LIABILITY, DAMAGES, LOSSES OR INJURY (INCLUDING, WITHOUT LIMITATION, DIRECT, INDIRECT, INCIDENTAL, SPECIAL, CONSEQUENTIAL OR EXEMPLARY DAMAGES) WHETHER ARISING IN TORT (INCLUDING NEGLIGENCE, WHETHER ACTIVE, PASSIVE OR IMPUTED), CONTRACT, WARRANTY, STRICT LIABILITY, RELIANCE OR UNDER ANY OTHER THEORY RESULTING IN WHOLE OR IN PART, DIRECTLY OR INDIRECTLY, FROM THAT ENTRANT'S PARTICIPATION IN THE SWEEPSTAKES AND/OR THE ACCEPTANCE, USE OR MISUSE OF ANY PRIZE THAT MAY BE WON, AND WHETHER OR NOT SPONSOR HAS BEEN ADVISED OF THE POSSIBILITY OF SUCH DAMAGES. PRIVACY. Personal information collected from entrants for entry to Sweepstakes is subject to Sponsor’s privacy statement available at https://www.reynoldslakeoconee.com/privacy-policy. Sponsor may engage certain third party companies to perform services in connection with the administration of this Sweepstakes and information provided by entrants may be collected and used by those third parties for purposes of administration of the Sweepstakes and the fulfillment and verification of prize awards. Entrants agree that: (1) any and all disputes, claims, and causes of action arising out of, or connected with, this Sweepstakes or the acceptance, use or misuse of the prizes awarded, shall be resolved individually, without resort to any form of class action, and exclusively by the United States District Court for the Middle District of Georgia or the appropriate Georgia state court located in Greene County; (2) any and all claims, judgments and awards shall be limited to actual out-of-pocket costs, but in no event including attorneys' fees, disbursements or court costs; (3) under no circumstances will entrant be permitted to obtain awards for, and entrant hereby waives all rights to claim, punitive, incidental and consequential damages, and any other damages other than for actual out-of-pocket costs; and (4) any right to a jury trial in any dispute, claim, or cause of action arising out of, or connected with, this Sweepstakes is hereby waived. COPIES OF THE RULES AND WHO WON. Requests for the name of the winner (after April 23, 2019) and these Official Rules may be sent to, Oconee Golf Company LLC, Attn: Reynolds 360: You + Three Sweepstakes, 1000 Vista Drive, Suite 119, Greensboro, GA 30642. All requests must be received by June 30, 2019.